Still Waters offers retreat space for individuals and/or couples to enjoy God’s presence in silence and solitude for a few hours or a few days. You may come for a self-guided day retreat, during which you are invited to use the available space as you need, perhaps settling into a bedroom during your time, visiting the library and hunkering down in an easy chair, or cozying into the chapel rocking chair to gaze out over the still waters beyond our old oak tree. You are welcome to use the indoor and outdoor spaces as you desire. Another offering is a directed day retreat, which is much the same as a self-guided day retreat, with the addition of a time for you to meet with a spiritual companion. A spiritual companion makes himself or herself available to help focus the intention of your retreat, and to listen with you to how the Holy Spirit is leading in your life. Please see the Spiritual Companionship page for more information on the role of a spiritual director. 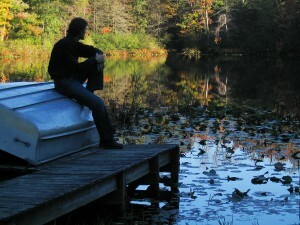 Still Waters also offers self-guided overnight retreats. During your overnight retreat, you will stay in one of five cozy bedrooms, or perhaps, if you are seeking greater solitude, out in our cabin in the woods. In the retreat house, you will have access to shared bathrooms, a living room, chapel, dining room, kitchen, and library. The overnight retreat is generally over a 24-hour period. If you are staying in our cabin, Tiqvah, your situation will be somewhat more rustic, with a simple outhouse and oil lamps/flashlights. There is no electricity or running water in the cabin. Or perhaps you are desiring a directed overnight retreat, with a spiritual companion to meet with you daily during your time here. A spiritual companion makes himself or herself available to help focus the intention of your retreat, and to listen with you to how the Holy Spirit is leading in your life. Please see the Spiritual Companionship page for more information on the role of a spiritual director. When there is more than one retreatant using the retreat house space at a time, we do ask that the silence be respected, including mealtimes, unless other arrangements are agreed upon by the retreatants. Again, the outdoor and indoor spaces are made available for your use whether here for one day or for several. And don’t forget the prayer labyrinth, particularly beautiful in April as the daffodils bloom!